Fresh and quality products are often the main ingredients of any great recipe. 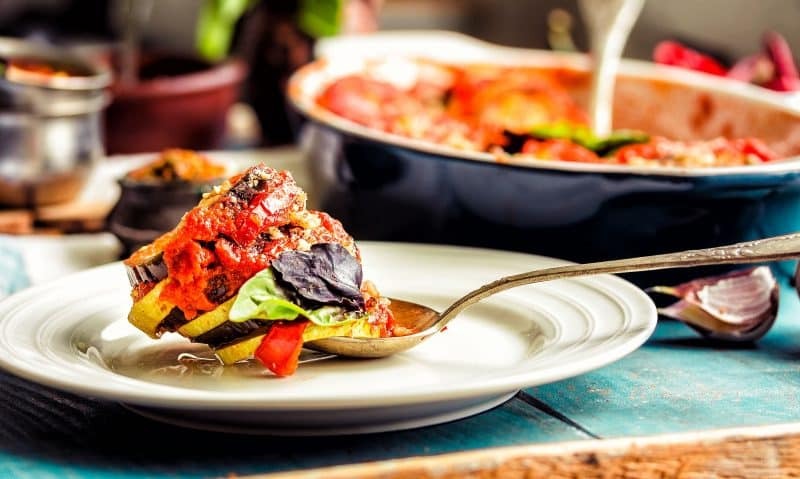 Last summer, we had so much pleasure strolling around this indoor local farmer’s market to pick up the tomatoes, zucchinis, eggplants, and peppers we needed to make our ratatouille provençale recipe. The colors and beauty of this vegetable market stand (étale) is so cheerful– if we could we would send you the scent too, the scent of freshness, priceless! In the US, we opt for the organic section of our local grocery store (only if the vegetables look fresh which they don’t always do if they have been out too long) and pick up US grown produce (less carbon footprint and great way to support US organic growers) as much as possible. This weekend, we’ll served our ratatouille provençale with a delicious pork roast – a nice marriage but a ratatouille is a very versatile side dish and goes with pretty much anything, even left over meat. So to bring a little bit of Provence to your table, check our detailed recipe and Art of the Home suggestions below. Enjoy and bon appétit! Mince oinons and put in large pot. Without peeling vegetables (but cut both ends of the zucchinis and top part of the eggplants), cut all vegetables in small chunks and put in large pot with the onions. Cook vegetables under low heat for about 10 minutes. This will allow to gently remove some excess water from the vegetables, extracting the most out of their flavor. Add crushed garlic cloves, laurel leaves (broken in pieces), thyme (leaves only), salt & pepper. Sprinkle olive oil over the vegetable mixture. Cook for 5-10 minutes under low heat, stirring occasionally. Add couscous spices and simmer, covered, under low heat for 30-40 minutes (depending on how crunchy you want the vegetables to be). Stir from time to time and if vegetables start to stick at the bottom, add a tiny bit of water. Add more spices as needed according to taste. Serve as a side dish, hot or warm. Leftover: great addition to pasta instead of tomato sauce or in an omelette. 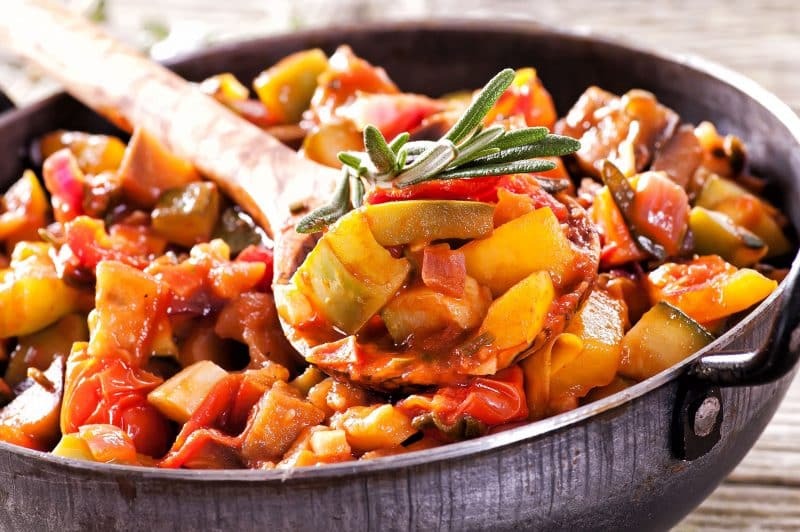 Meal: pork and lamb are great companions to a ratatouille. Picnic idea: can be served cold for a picnic dish.